Will EU countries accept DG Health’s flawed proposal on hormone disruptors regulation? Remember the story of how the EU was going to take action against hormone disruptors, or EDCs? This week will see another make-or-break moment for the regulation of these harmful chemicals, fought heavily by the chemical industry, when a group of Member State experts will meet. 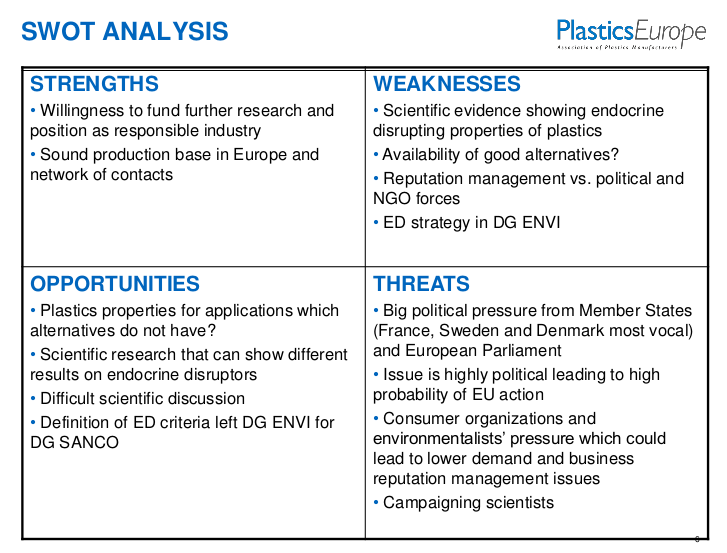 Leaked slides from internal industry presentations from PlasticsEurope and CEFIC (the lobby group of the whole chemical industry) show that twisting and undermining the science on EDCs, which they admit threatens their products, and getting their own ‘science’ to the EU authorities in charge, has been a key, and rather successful, strategy. (See for more background the bottom of this article). Endocrine disrupting chemicals (EDCs) are chemicals that are present in several products we come into contact with every day – from plastics and cosmetics to pesticides. Because of their ability to interact with the hormonal (endocrine) systems of living organisms, they are suspected of having serious detrimental effects on human and environmental health. According to its 2009 Pesticides Regulation, the EU is supposed to ban hormone disrupting chemicals. Because industry had lost the battle at the legislative and political level, it had to find ways to hollow out these regulations. Following a massive lobbying campaign, it has so far managed to delay and weaken the first step needed to start regulating EDCs: establishing the scientific criteria to identify them. This is what this week’s discussion will be about, once more. The first slide in the leaked presentation contains a SWOT analysis (Strengths, Weaknesses, Opportunities and Threats) for industry’s campaign against action on EDCs. In the section ‘Weaknesses’ we find: “scientific evidence showing endocrine disrupting properties of plastics”. So much for “science-based” policy-making, which industry constantly calls for.. The admission is clear: beyond the slogan, industry only cares about the evidence supporting its commercial interests. It gets worse: the “Opportunities” section mentions that scientific research “can show different results on endocrine disruptors”, and that the EDC debate is a “difficult scientific discussion”. Combined with the listed “Strengths” that industry is willing to “fund further research”, it is not hard to recognize the classic strategy of ‘manufacturing doubt’ over any scientific evidence which shows the harmful effects of industry’s products. This was a strategy that was made up by the tobacco industry in the ‘50s. The fact that industry has a “sound production base in Europe and a network of contacts” adds insult to injury: it implies that it will possible to scare politicians about job losses. “(Business) reputation management” along with “consumer organizations and environmentalists’ pressure” are placed in the boxes ‘Weaknesses’ and ‘Threats’. This seems to contrast with the perceived “Position as responsible industry” listed under 'Strengths'. The second slide shows the known industry strategy to have EDCs regulated as all other chemicals, i.e. with a ‘safe threshold’ - precisely something that is not possible for EDCs. Also, loopholes are advocated that would leave certain EDCs untouched, such as including the ‘potency criterion’. This strategy should allow the industry to “avoid regulation of EDs in product and waste regulation”. The third slide presents a ‘Key Stakeholder Analysis’, categorising different actors according to their position - positive or negative for industry’s interests, and also showing which actors should be moved into a more prominent role in the decision-making process. This is interesting as it shows how industry not only lobbies various EU institutions to try to influence their position, but also tries to influence the very rules of the decision-making process, making sure that certain institutions get listened to more. 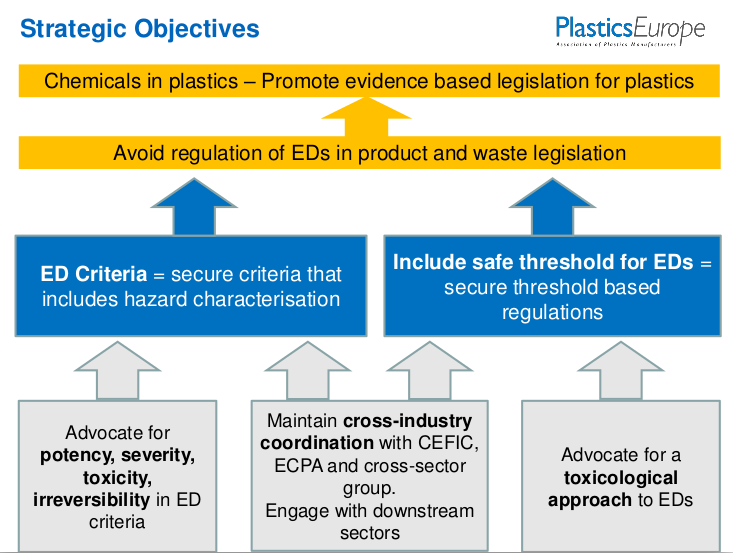 The German, UK and Irish governments are identified by PlasticsEurope as the most important pro-industry governmental allies. Actors that support industry’s aims and whose role should be increased in the decision-making process are DG Enterprise, DG Research, DG Health and EFSA. Together with public health NGOs, the French, Swedish, Spanish and Danish governments on the other hand are identified as industry’s most dangerous opponents. Germany's Environmental protection agency (UBA) gets a special mention in this category too. DG Environment and the European Parliament Environment and Food Safety Committee (ENVI) are identified as actors that pose a threat to industry’s interests, and that should be moved in a more harmless direction. 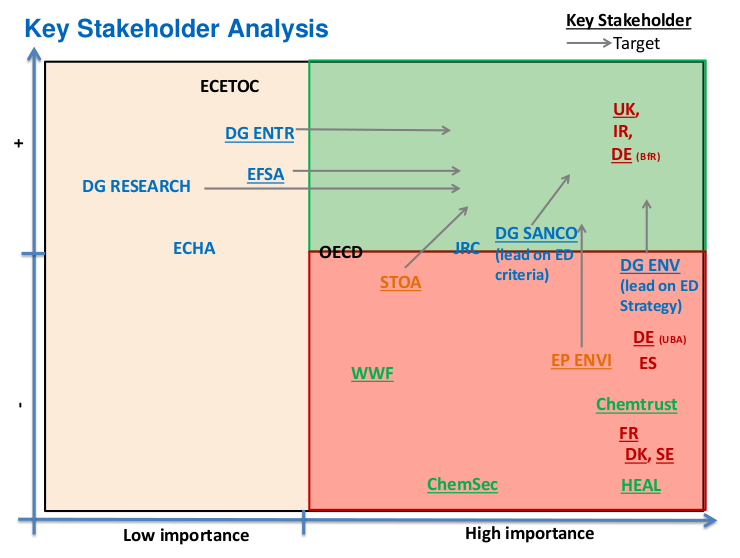 The Long-Range Initiative (LRI) of the chemical industry’s lobby group CEFIC is rather explicit about its aims: to be a “partnership based on sound science with a mission to develop leading chemical safety assessment research”. In other words, to pre-empt the work of regulatory agencies and develop testing methodologies to make sure industry at least partly controls the rules of the game. CEFIC-LRI director Bruno Hubesch puts it this way: “LRI is not science for science’s sake, but science to have a political impact”. What is less public is CEFIC’s satisfaction about its programme, detailed below. This slide was part of a presentation made to CEFIC’s Board in 2014, and sums up the outcome of their investment. 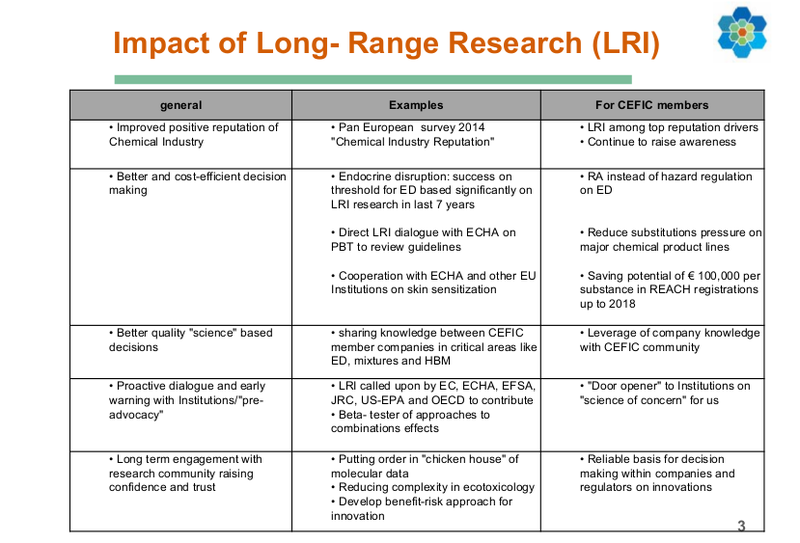 It is self-explanatory: according to them, LRI has successfully influenced regulators, as it is has been called upon by the European Commission, the EU Chemicals Agency ECHA, the EU Food Safety Authority EFSA, the Commission’s own research center JRC, the US Environmental Protection Agency and the OECD (where strategic international guidelines for testing protocols are defined). Moreover, according to CEFIC, the LRI program has enabled CEFIC members to derail the EU’s attempts to regulate EDCs. In other words, it has helped make it that EDCs will be regulated as other products by a risk assessment, and not by a hazard regulation. A hazard regulation means that there is no safe level of the product, and so it must be banned if it is found to be an EDC. It is not clear what the result of this week’s vote will be in the so-called standing committee, where Member States send their experts. If DG SANTE’s proposal is not approved, it will be sent to the Ministers in the Council (Member States), who will have two months to adopt or reject it. The European Parliament will also have a final possibility to reject it, for instance, if it considers that DG Health has twisted the meaning and aim of the Pesticide Regulation in favour of industry’s interests. The report A Toxic Affair by Stephane Horel and Corporate Europe Observatory gives a detailed account of how the chemical lobby managed to delay and derail action on hormone disrupting chemicals. This included a letter by a group of scientists, many of whom had ties to the industry, that was used by the Commission to legitimise ordering an impact assessment. Since then, DG Environment was removed from the file, and replaced by DG Health. Scientific authorities in the field of EDCs strongly condemned the options given by DG Health for the impact assessment. In April 2016, as accounted in a follow-up article, a group of prominent experts wrote in the international peer-reviewed scientific journal Environmental Health Perspectives, expressing their concern that “distorting scientific definitions can be used as a way to modify the spirit of a law (i.e., to move from a hazard-based to a risk-based management) thereby muddling science and policy” and that DG Health was wrongly arguing that there is a ‘lack of scientific consensus’ on EDCs, “leading in postponement of application of several laws voted up to 10 years earlier to protect public health”. When DG Health finally proposed a set of criteria to define EDCs in June 2016, the result proved worse than expected: an impossibly high burden of proof was demanded prior to any potential ban of chemicals acting as endocrine disruptors, by requiring a demonstration of causality between an adverse effect in humans and an endocrine mode of action. At the end of 2016, Le Monde published a mind-blowing trilogy by Stephane Horel that showed the extent to which science was being ignored and distorted in the EDC battle. The three parts covered the dubious role played by EFSA, the interference by the United States in a WTO committee, and again how DG Health based their insistence on ‘lack of scientific consensus’ on a paper largely authored by employees of specialised ‘product defense companies’, Exponent and Gradient Corp, hired by the key chemical and pesticide industry lobbying organisations at both sides of the Atlantic: the European Chemical Industry Council (CEFIC), the American Chemistry Council (ACC), CropLife America, CropLife Canada, CropLife International and the European Crop Protection Association.